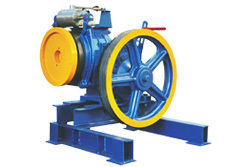 The machine will be traction type with an AC motor, electro mechanical brake, heat treated alloy steel worm shaft, centrifugally cast bronze worm gear wheel and superior grade cast iron drive sheave all compactly mounted on a single base or bed plate. Taper Roller Bearings ensure end thrust absorption and Spherical Roller Bearings ensure enough traction and minimize rope wear and tear. Our Products are enriched with deep and wide experience gained from substantial presence in the Elevator Industry. We have installed several elevators in both public and private sector. A technology sound and strong team of Electrical, Mechanical and Electronic Engineers Specialised in elevator technology provide the right impetus for Airson to reach zenith of excellence and perfection in elevator erection and installation.